Whenever I get my hair done I like to change up the products I'm using to see if something different can help to repair all the bleaching damage. Recently I've been using this shampoo & conditioner set from Yuko & I'm pretty wowed by the results! Yuko is a Japanese hair care brand best known for their permanent hair straightening treatments which straighten hair without damage. To complement their salon services they launched a home hair care range with different products for each hair type. The Bella products are aimed towards those with chemically treated hair. It doesn't matter if you've had a Yuko straightening treatment or not, you can still use this shampoo & conditioner. If your hair is dry, thin, brittle, colour damaged or heat treated then these products would be perfect for you. This set normally costs £25 but Baobella Boutique currently have it on offer for just £9.99. In another post I mentioned that I only wash my hair once a week. To those of you asking how, well when your hair is as bleached as mine is, it tends to stay very very dry. A bit of Bumble & Bumble's Dryspun Finish helps things along too! Of course when I do wash it I need to use something quite clarifying to remove all the product buildup. 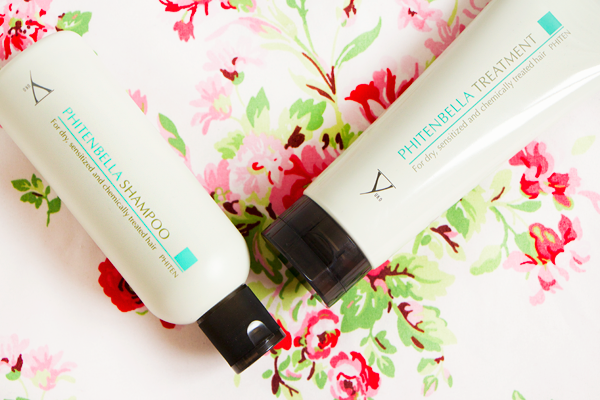 The Phitenbella shampoo leaves my hair feeling squeaky clean. Clarifying shampoos aren't the friendliest of products for those with chemically treated hair but this one is different as it's so gentle. The shampoo is clear & has a light pleasant scent. You only need a tiny bit because it lathers up so well. It features proteins & collagen to revitalise damaged hair. Protein is important in haircare because it helps to strengthen the hair strand reducing breakage, while the collagen smooths frizz & brings out shine. Since I started using this shampoo my hair feels much fuller from root to tip. It really helps to keep it big & bouncy after a blow dry. The ends feel so thick & I've had fewer split ends. My ends normally gets quite straggly if I get my roots bleached without a haircut afterwards but these products have really helped to minimise the damage. The treatment conditioner is really thick & creamy. It contains nourishing jojoba oil and keratin which penetrates & fills damaged parts of hair. This makes your hair feel stronger and look shinier too. I love the intense glossiness this product brings to my locks. It's notoriously difficult to make bleached hair look healthy but this stuff manages it. Admittedly it doesn't make my hair feel as soft as some other intensive conditioners I've tried but all the other benefits more than make up for it, especially when I can just pop some hair oil on the ends for softness. When I use this treatment my hair looks sleeker but the conditioner doesn't weigh it down at all. I really like the balance these products bring to my hair. Even though they're hydrating & repairing my hair they also give it lots of body & volume. My hair has never looked so full of life. I would thoroughly recommend this range for anyone with chemically damaged hair. Have you tried anything from Yuko before? I'm like you, whenever I get my hair done I use it as an excuse to try new haircare :) my argument is that I have "new" hair and it needs new products, pahah!